Coconut Milk Affogatto via my Nespresso VertuoLine. VIDEO. A cool, creamy coconut milk popsicle melts into frothy, rich, hot coffee freshly prepared using my Nespresso VertuoLine machine. This is a summer meets fall beverage to put on your must-sip list. Sweet and rich, this coffee beverage pairs well with brunch, afternoon nibbles or even as an after-meal treat. (For later in the day, just use decaf!) Get two easy coffee recipes, plus check out how much I love Nespresso's latest machine via a VIDEO to watch the machine in action. And FYI I always aim to please, so there are kitty cameos at the end of the video. 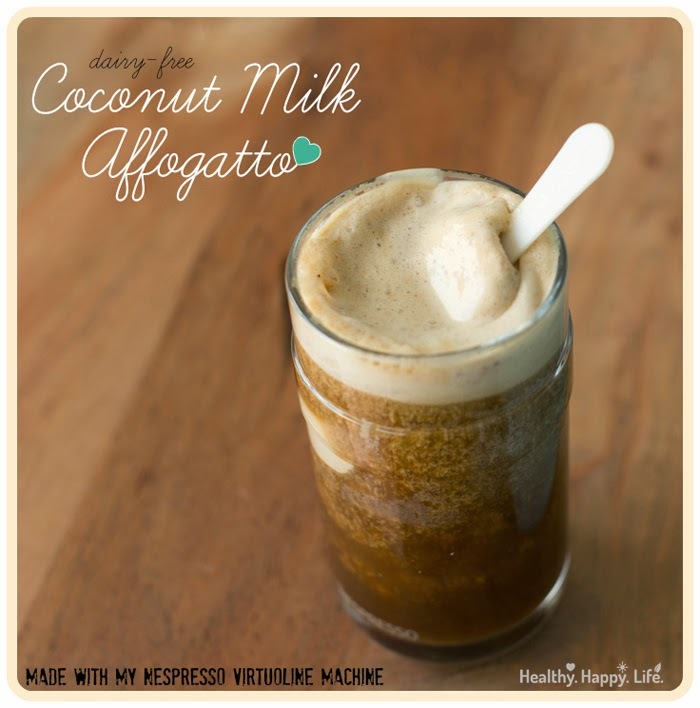 your welcome ;)..
Coffee bevie inspiration today... An affogatto and a Nespresso VertuoLine Latte Video! Video of my cinna-maple latte.. The Coconut Milk Popsicle Affogatto.. I credit the classic Affogatto beverage with turning me onto coffee. When I was about ten or eleven, my friends and I would stumble into a tiny coffee shop near my house after school or during the day in the summer months. We would order warm butter-melted-on-top cinnamon buns and dive into them with eager forks. Well one day we decided to try something called an Affogatto. We saw a girl order one and dive her spoon into the melting vanilla bean scoop of ice cream, submerged in steamy black coffee. One bite of that coffee-melted ice cream and we were hooked. Probably not the best beverage for pre-teen girls, but ah well. 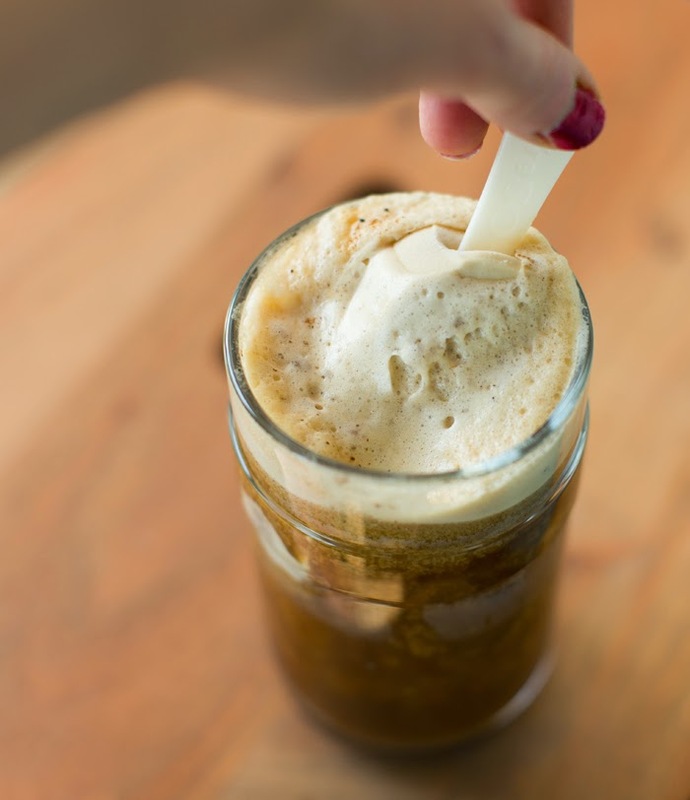 So yes, what is an Affogatto? 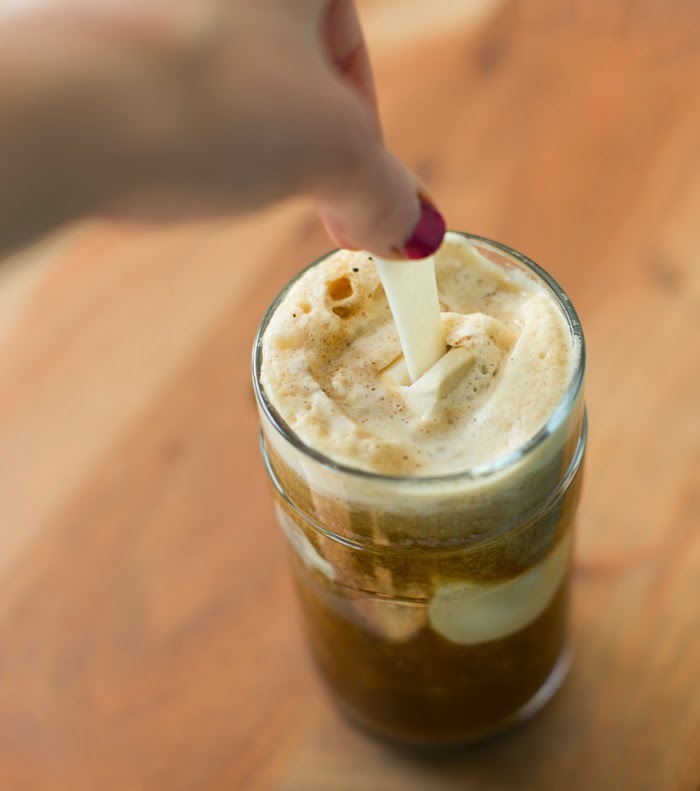 As I described, it is basically a glass of coffee or sometimes coffee and espresso with a giant scoop of ice cream plunged into the warm beverage. The ice cream melts as you sip and spoon the sweet coffee. 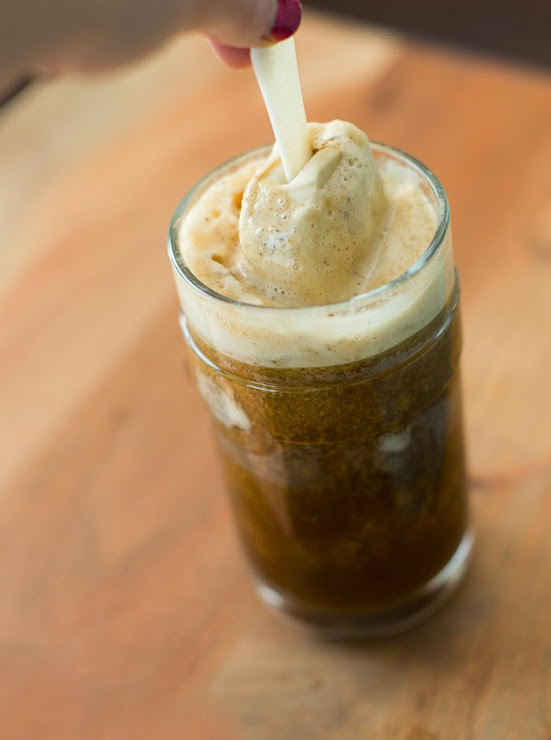 Flash forward to now, and I created this dairy-free, healthy spin on a classic Affogatto. Instead of high-fat dairy-free ice cream, I use a 80 calorie coconut milk popsicle (I used one from SoDelicious brand). Creamy rich and a bit lighter. Plus, the popsicle has a built in stir stick! The base is coffee made using my Nespresso VertuoLine machine. I adore this machine because it carries all the speed and convenience of "pod coffee" but the flavor tastes like a freshly brewed pot, or even better, French pressed coffee. The most amazing thing about this machine is the froth! Mega froth from each mug. No separate frother required. Simply magical. I cannot wait to make fall-favorite vegan Pumpkin Spice Lattes using this machine! For the affogatto I used these coconut milk mini bars in just java flavor. Any non-dairy ice cream bar works. Store-bought or make your own. For make your own try my chocolate covered ice cream bars. 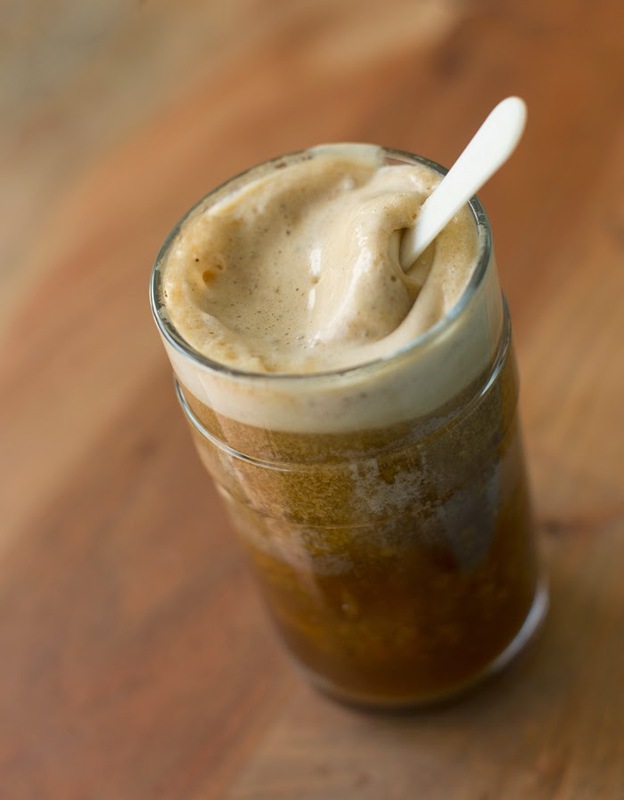 this easy as can be recipe for a dairy-free affogatto includes the two classic ingredients: coffee and ice cream. Brew the coffee. I used my one-touch method via my Nespresso VertuoLine machine. Tip: Leave about half the glass empty so you can add the ice cream part without spilling. Stir in the coconut milk popsicle and serve! If using ice cream, simply add a scoop to the coffee glass. *disclosure: thank you to Nespresso for providing me a machine + an iced coffee goody box. this is not a sponsored post.